It is the beginning of another month and thus time for another installment of the Ohmygod saga (to catch up on the previous installments click on the Ohmygod menu up top). As you will recall, I used to be a cycling tour guide in Europe for several years. Through that job (yes, it is a bit difficult to call it a “job”) I met countless interesting people and have a few compelling stories to tell, but most of them pale to the story of Ohmygod, one of the clients that I had for three weeks. Some may wonder about the moniker, but the name chose itself really; it is what I uttered repeatedly during just about every interaction with him. In the previous installment (Part Forty-Seven), after a night of translating one particularly delicate word for Adonis in a dark park near the hotel (and receiving corporal punishment for my services), I woke the next morning to witness perhaps the most dysfunctional relationship of all time at breakfast. Undaunted, I headed out on what I decided would be an epic bike ride, forgetting the trials and tribulations of one of the best jobs one could hope to have for at least an afternoon. I had plotted a ride that would take me first out to the coast and to the beach town of Blankenberge, across the canal inlet at Zeebrugge, and then on to the Dutch border at the town of Sluis where I would pick up the Damse Vaart canal bike path which would take me to Bruges’ former port, Damme. By then, I would be ready for lunch in the tiny medieval town (now a sort of haven for bibliophiles) and I would search out the elusive Pater van Damme beer. Like most Belgian beer, it is served in its own special receptacle, which for the Pater van Damme is ceramic cup that contains two thumb punts in the side (presumably to aid in drinking, particularly after a few had already been consumed). As far as I have been able to ascertain, the beer is only sold at the little sandwich shop, Tijl en Nele, in the center of town—a place that coincidentally also rented bikes. None of the canals in Flanders require any climbing, but many of them are lined with impressive trees. A pretty fair trade, I would say. The nearly pancake flat 65k (40 mile) ride went off without much of a hitch with two rather significant exceptions: the wind in West Flanders is no joke, it is brutal; and getting stopped by a rather large ship entering the canal added a good half an hour or so to the ride time. Despite these painful impediments, the ride to Damme took just a few minutes longer than planned, but it was enough of a delay that when I arrived, there was quite a crowd at the café. I pondered searching out another establishment, but there really are not a ton of options in Damme, and I really wanted to try the beer. As luck would have it, there was a table with three cyclists who were just sitting down, and since they could see that I was both alone and likely to pass out at any minute for hunger, they mercifully asked me to join them. They were Dutch (and therefore spoke perfect English), and had taken the same route as I had from the border. It was a common route and destination for the trio, and before I knew it, the waitress had come and gone before I had a chance to even contemplate an order. Unknowingly, they ordered for me, and assured me that I would like the sandwich and love the beer. As one might expect the beer showed up quickly, as did the second, and I think the third arrived in conjunction with the food (or maybe it was the fourth). By this time, I was rather “happy” and the conversation flowed from doping in cycling to American politics to the inherent benefits of beer as a recovery drink for cycling. Close to an hour and a half later, I stressed that I needed to get back to Bruges, but my new Dutch cycling brethren cajoled me into one more beer, stating that my destination was a mere 6k (just under four miles) away. That last beer was as fabulous as the previous, but those 6k felt like 60. By the time I got back to the hotel, I had just enough time to catch the end of that day’s Tour de France, so I opened the mini-fridge for a beverage to find not just a Westmalle Tripel, but also a Rochefort 10. I decided to try both since, well, I could, and I had arranged for a pre-dinner beer tasting at a bar just around the corner from the hotel, and I figured I needed a bit of a primer. 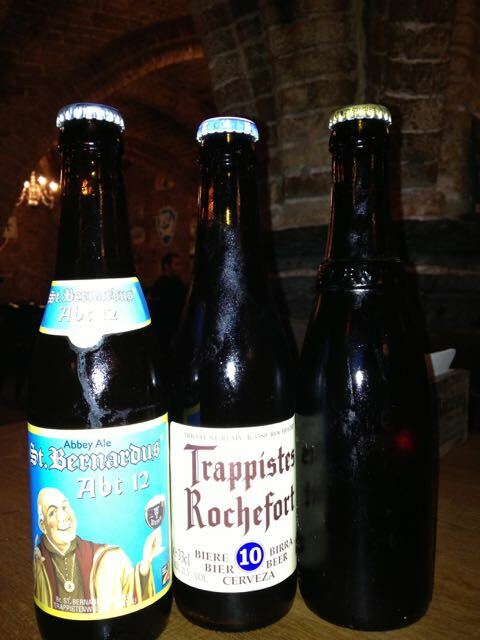 The bar, Le Trappiste, is located in the basement of a former mill, and is simply stunning: beautiful brick vaulted ceilings and a majestic bar, festooned with a smattering of stools, with dozens of beer-specific glasses serving as some sort of hedonistic canopy at either end. I had stumbled into the bar the last time I was in Bruges, and the owner/bartender, Regnier De Muynck, after I had ordered a Westvleteren 12 (what many consider to be the best beer in the world), asked if I would be interested in a little taste test between the Westvleteren and two other beers that he considered to be on a par with my order, but had received considerably less acclaim. That tasting was both a lot of fun and rather informative, so I decided to replicate it for the group. I had left word to meet at the bar at 6:30 p.m., and to my surprise everyone showed up right on time (including Ohmygod, which actually was not all that surprising as it involved beer). Regnier set up a blind tasting of three beers: St. Bernardus Abt 12, Rochefort 10 (which I had consumed only moments before in the hotel), and Westvleteren 12. Now, I am not sure if anyone else saw this as a competition, but I sure did. After all, I have written countless wine tasting notes, been involved in several blind tastings, and I am more than a tiny bit competitive (if you have not picked up on that already). Regnier set up the tasting thusly: he would bring each beer out one at a time, letting us know which one it was, and we were to taste it, taking notes (either mental or otherwise—I used my iPhone). After the “introductory” period, he would then return with a small glass of the beers, again, one at a time, but this time “blind” (the beer’s identity was kept hidden), and we were to guess the beer based on our notes. Piece of cake—it was in the bag. Rochefort 10: Cost 5€ ($6.50). Reddish Brown color, viscous with a bit of a fruity nose (banana?) and a hint of mocha on the backend. Westvleteren 12: Cost 12€ ($16). Perhaps a bit creamier with less fruit, and a more caramel or toffee finish. St. Bernadus Abt 12: Cost 4€50 ($6) A bit darker in color perhaps (? ), with a similar nose to the Westvleteren, but maybe a slightly more nutty flavor on the finish. I did not take the most detailed notes as it was my first time performing such a task with beer (or perhaps more to the point, we were in a bar after a long day), but I was pretty sure that I had enough to go on. Yeah, I was going to crush it. Well, it did not go all that well in the end. The beers, despite my notes, were very hard to distinguish when tasting one by one. I like to think it would have gone down better if we were able to taste them side by side—perhaps exactly why Regnier set it up this way. In the end, I got one of the beers right (the Rochefort) and although defeated, I still felt marginally good about getting at least one right. Probability of randomly getting all three right: 1/6 (16.7%). Probability of randomly getting all three wrong: 1/3 (33%). Probability of randomly getting one right: 1/2 (50%). So my “success” boiled down to a coin flip. The rest of the clan fared about as well as I did, with everyone else either getting one or none right. There was one, however, who nailed it. Ohmygod correctly identified all three beers. As we headed out of the bar and across town to dinner, I re-did the tasting several times in my head, trying to figure out how Ohmygod could have “beaten” me. There was the obvious explanation that he was far more well-versed in beer than I, but the fact that 98.7% of the beer that he consumed was Molson Canadian did not make me feel any better. Then there was the statistical interpretation: dumb luck. Out of the eight of us doing the tasting, if we all simply guessed, the probability of one getting all three correct was pretty high. And that one was Ohmygod. By the time we had reached our restaurant on the Markt, I had pretty much put the tasting behind me, convinced that no one else saw it as a competition and thought any less of my tasting abilities. As we were sitting down to dinner, Ohmygod touched my shoulder and asked if we could have another blind tasting at dinner, this time for money. Actually, I didn’t. But I sure wanted to. I had reserved a table outside, right on the square, and as we sat down, the configuration was precisely the same as it had been at Le Trappiste: Adonis sat to my immediate left, which surprised me a bit, given our last encounter. He slapped me on the back as he sat down in a “hey, great to see you again!” kind of way, which was more than a bit troubling. Across from Adonis was Maggie, who had spent the entire day with our own little Greek god, riding out to the beach and having lunch before returning to the city. Paul, apparently holding out hope that he could still somehow convince Maggie to assume C.C.’s role of trip romantic interest, sat to her right, while Brad, trying to get as far away as possible from Angelina, was on her other side, directly in front of me. That put Angelina opposite Paul, Anita to my immediate right, and Ohmygod across from her, both at the end of the table. As with many of the trips, it felt like middle school all over again as students assumed the same seats repeatedly although no seating chart had been imposed; a fact that I would certainly need to address at the next meal as there was no way that I could survive the week with Ohmygod in such close proximity at every meal. I had billed the evening as a chance to try one of Bruges’ specialities: mussels. Our restaurant was not the best place in town for the black-shelled mollusks, but there were close to a dozen different choices, each coming in a large, deep pot with all-you-can-eat French fries. Our server was at least moderately attractive and Adonis immediately noticed, nudging me with his elbow as soon as she approached our table. I was not entirely sure, but it seemed as though as a result of last night’s episode, he had enlisted me as either a fraternity brother, a “wing-man” or both. Maggie immediately noticed Adonis’ diverted attention and began to visibly pout, causing me to wonder what might have happened after (or even during) their day together. Angelina was actively studying her Scrabble words, and Paul, to his credit, was trying to convince her to put them away, at least for dinner. While it appeared as though his suggestion was based in Emily Post’s teachings, it may have been more selfish in intent as it was clear that his chances with Maggie were slim, and it was also evident that Brad was out of the picture. Speaking of Brad, I looked up from my menu and noticed that he had something on his upper lip. I tried hard not to stare, but I was fairly certain that it was not there at dinner the night before—I did not notice it in the bar just moments before, but it was fairly dark and I was far too focussed on “nailing” the tasting than evaluating anyone’s facial features. I ordered several different styles of mussels for the table: White wine, provençal, curry, roquefort cheese, and natural (i.e., plain). Just as the server was about to leave, however, Ohmygod spoke up and uttered a few sounds that were quite peculiar. The server was a bit stunned, as were the rest of us (with the notable exception of Adonis, who saw her additional time at the table as a bonus—more time to ogle her ample bosom). After three or more times trying to read the Dutch dish from the menu, she approached and he pointed to the dish in question. “Really?” she asked. He nodded emphatically, and she was on her way. I asked him what he had ordered, and he once again tried to pronounce the name of the dish in Dutch. I asked him to point it out on the menu (I always keep a menu to facilitate the ordering of additional drinks as the evening progresses). He pointed to the third of the main dishes and after glancing at it, I asked him why he ordered it. “Do you know what that is?” I responded. “It is eel in a squid ink sauce” added Adonis who was looking at the menu now that the server had left the table. “What? How do you know that?” Angelina chimed in, having put away her Scrabble word pages, at least for the time being. “All of the dishes are translated into French, German, and English right below” I added, immediately turning my head to Ohmygod for his reaction. He was half-turned in his seat, however, not paying any attention to the conversation flowing all around him. Instead, he had his right hand above his head, with the two “peace” fingers extended. His left hand was also extended, grasping his empty beer glass, trying to flag down a server. When no such help arrived, he retracted his right hand and placed the two extended fingers into his mouth, letting loose a loud, high-pitched whistle that caused every head in the restaurant to turn. He took his fingers out of his mouth, then snapped them before once again flashing his “peace sign” and then pointing to the empty glass. Continue on to Part 49. This entry was posted in Beer, Belgium, Ohmygod. Bookmark the permalink. Yeah, I was kind of building for the next episode….